Photograph kindly provided by Alex Vella, President of the Ramblers' Association of Malta. 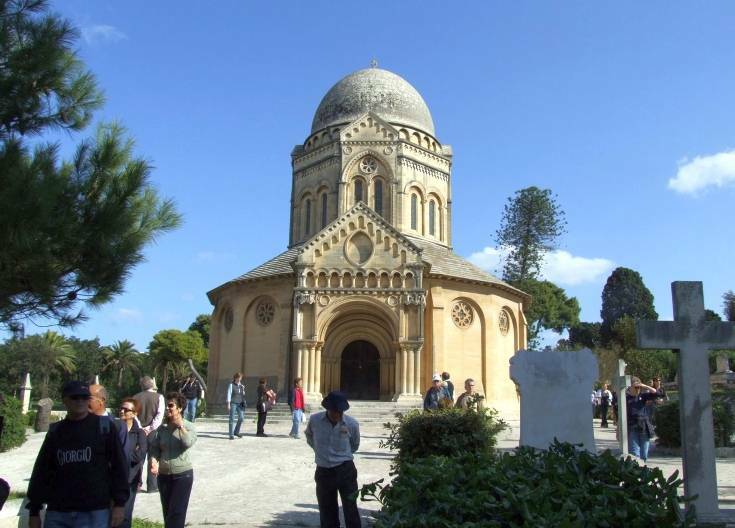 Ta' Braxia Cemetery is also known as Pietá Military Cemetery. John Loughborough Pearson (1817-1897). 1893. Pietá, Malta. [see also a view from the road by JB.] 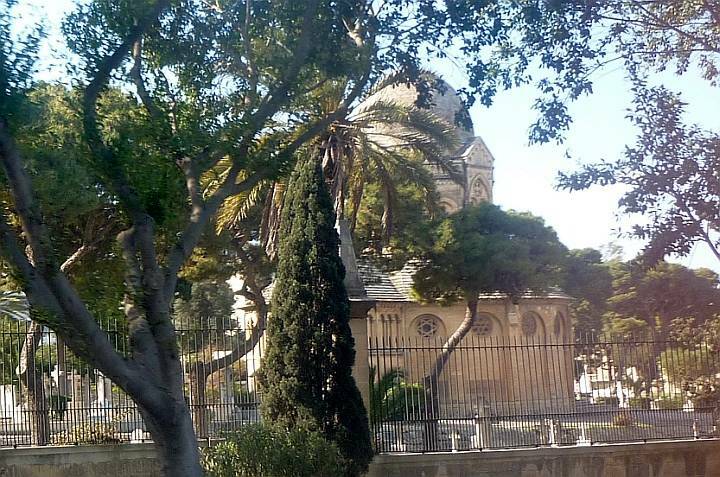 The cemetery itself was planned by Emmanuel Luigi Galizia when he was still only 25, and opened in 1857 when older cemeteries in the area became full. There was considerable opposition to out-of-town and multi-faith interment, but it then became "the island's principal garrison cemetery" (Scerri). The chapel itself was built later, in memory of Rachel Gordon, wife of Governor Sir Arthur Gordon, whose last governorship had been in Ceylon. She had been too ill to continue her journey home, and died in Malta. Pearson, who was asked to design it, had not come out to Malta; the plans were sent from London. But the work would have been very closely supervised on his behalf. Malcolm Borg writes: "The chapel is a concoction of Neo-Romanesque and Neo-Gothic architectural decorative elements distributed over a centralised plan. It is highly sculptural, its structure is concealed by a crust of stone carvings laden with technical bravura." Such work, he continues, was very significant for Maltese churches, because it marks "the affirmation of Gothic not only as an alien Protestant statement but as a style entrenched in Roman Catholic architecture." He adds that this "complete fusion of religious cultures" is exemplified in Galizia's own Our Lady of Lourdes in Gozo, in its highly Romantic setting (94). NB The foundation stone of Our Lady of Lourdes was laid in 1888, so Galizia would seem to deserve more of the credit for this. Scerri, John N. "Cemeteries" (part of an excellent site on Malta's churches and chapels). Viewed 22 March 2010.